The purification of coal fly ash (CFA) leach liquor has been carried out using an integrated solvent extraction and precipitation technique. The integrated technique was employed to primarily remove two dominant impurities, Ti and Fe, from CFA leach liquor. The solvent extraction experiments were carried out at varying factor values of contact time, aqueous-to-organic ratio, and extractant concentration. Preliminary results showed no loading of Fe2+ onto the organic phase, partial loading of Fe3+, and a high loading of Ti4+. Unable to adequately load onto the organic phase due to the high CFA leach liquor acidity at pH 0.1, Fe3+ required reduction to Fe2+ in order to bypass the solvent extraction stage. To achieve this, an integrated solvent extraction and precipitation technique was formulated and adopted. The technique involved iron reduction from Fe3+ to Fe2+ as the first treatment of CFA leach liquor, followed by solvent extraction of Ti4+ and subsequent recovery of titanium as TiO2, crystallization of Al3+ and the precipitation of Fe2+, in the form of Fe(OH)2, as the last treatment. Alumina was recovered as a precipitate product in the form of (NH4) Al(SO4)2·12H2O, and the calcined alumina product contained 99.91% Al2O3. Primene JMT was used in small amounts of ~10% in kerosene for short contact times of ~15 min using an A/O ratio of 1:1 in order to achieve high extraction efficiencies during the solvent extraction step. 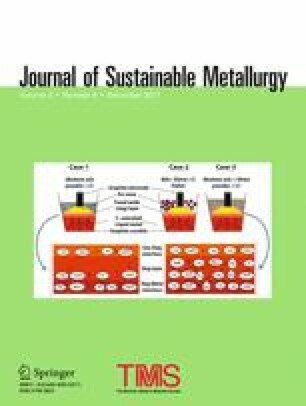 The results presented in this paper identify the integrated precipitation and solvent extraction route as an effective option for CFA leach liquor purification and alumina recovery. The authors thank Kendal Power Plant, a division of Eskom, for the CFA used in this study, and AngloGold Ashanti for use of their facilities for sample analysis. The authors thank the National Research Foundation and Department of Science and Technology (South Africa) for their financial contribution to the research.